A brand can be loosely defined as a constellation of words and images associated with products, services and experiences. The point of brand messages, including advertising, is to build brand value, which is directly related to profits. A brand’s value is the premium consumers are willing to pay over a generic version of the same thing. Investing in brand advertising is a way to avoid competing only on price. Because branding’s benefits are measured over months and years (and decades), brand spend is vulnerable to being cut or shifted to short-term tactics like promotions, discounts and timed offers. A widely-cited HBR study called “If Brands Are Built Over Years, Why Are They Managed Over Quarters?” stressed the dangers of neglecting branding in favor of promotions. The authors pointed to Vlasic and Lacoste as strong brands scuttled by short-term thinking, and Nike – which spends about $1.5 billion a year on brand advertising in the U.S. – as a long-term winner. Many marketers are convinced that brand advertising works, yet they struggle to determine how well it works for them. Brand advertising measurement can focus on how ads impact the business, how they impact consumers, or a combination of both. And it can use metrics that are direct or indirect. These two dimensions – business vs. consumer and direct vs. indirect – organize discussion of brand measurement. Business-centric brand valuation methods try to quantify advertising’s impact on financial metrics such as sales, profits, market share or intangible financial value. They attempt to answer the question: “What is the ROI of brand advertising?” As such, they speak the language of the CEO and CFO and are often done to support annual budget planning. Business-centric methods are also the basis of marketing mix models that use a financial metric such as sales, profits or market share as their dependent variable. Because of their complexity and data requirements, these models are also usually annual or semi-annual efforts and not used for individual campaigns. Business-centric direct methods attempt to measure the impact of brand ads on a key business metric such as sales. They use historical data and complex econometric or other regression-based models to separate brand ads from other factors that influence the outcome. Indirect methods focus on an outcome that is known – or hypothesized – to be highly correlated with the desired financial outcome. For example, the ability to charge a higher price or to avoid lowering prices in a downturn is considered characteristic of a stronger brand. Consumer-centric methods focus on the brands’ prospects and customers, rather than the business impact. They attempt to gauge that the impact of brand ads is on consumers’ perceptions, attitudes and intentions. Indirect methods of measuring consumer impact include observing behaviors known – or assumed – to correlate with long-term business impact; analyzing conversations, comments and searches related to the brand; and using voice-of-customer tools to assess impact. As you’ve guessed, the best approach to measuring the impact of brand advertising is to combine both methods. Most marketers already do this: running annual marketing mix models (and more frequent mini-models), alongside consumer surveys or brand trackers. Proprietary method – a handful of well-known companies have built a proprietary combined method that can be customized and is useful for benchmarking and long-term assessments. 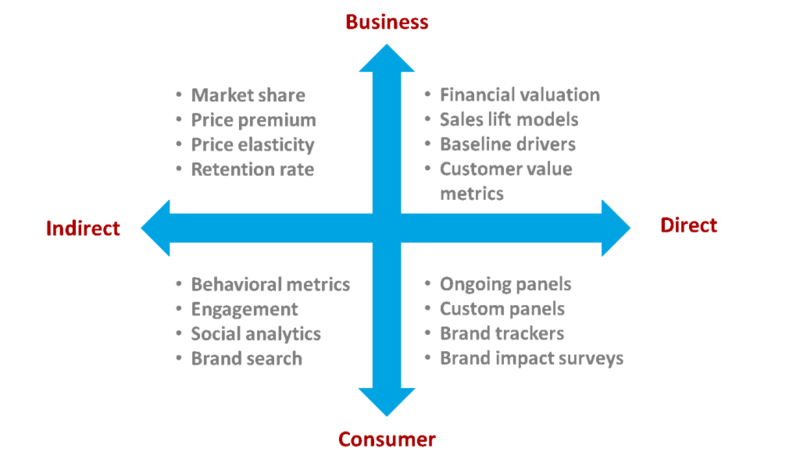 Multi-dimensional model – many marketing mix models incorporate brand health or equity as an input and can estimate its contribution to business success.